Kuldeep picked a brilliant hat-trick and his coach was extremely happy for him. 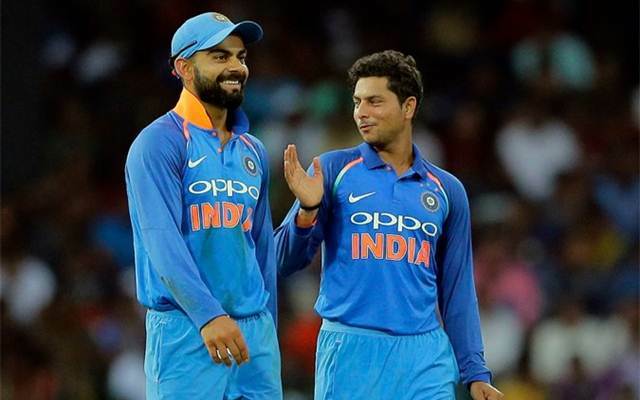 The coach of Kuldeep Yadav, Kapil Pande is not at all pleased with the Indian skipper Virat Kohli who received the Man of the Match on Thursday. The chinaman bowler lit up the iconic Eden Gardens by picking up a sensational hat-trick against the Aussies which helped India seal the game easily by 50 runs on a topsy-turvy day in Kolkata. However, Pande was not happy with the fact that Kohli didn’t share his Man of the Match award with the youngster to encourage him. Similar words were echoed by Chetan Sharma earlier today, who was the first Indian bowler to take a hat-trick in ODIs. India, after opting to bat first, failed to put up a big total on the board but posted 252 on the back of Kohli’s magnificent 92 in the scorching heat. In reply, Australia was looking pretty to chase down the middling total and only needed one partnership to get over the line. But Kuldeep, who was having an ordinary day by then, wrecked havoc in the opposition camp in the 33rd over by dismissing Matthew Wade, Ashton Agar and Pat Cummins off the successive deliveries. The wickets ended all the hopes of the visitors to level the series. Kapil Pande was not amused with the skipper Kohli and thought that he should have shared his award with the youngster. “Kohli is a senior member of the team and he could have encouraged the junior players by sharing the honour,” he told Deccan Chronicle. But he was all praise of his student who bowled extremely well even after being put under pressure at times. The coach also termed his feat on the pacer friendly wicket at Eden Gardens as ‘remarkable one’. “The wicket (at the Eden Gardens) was new and only helping the pacers and on this wicket the hat-trick achiever’s performance was remarkable. Initially, Kuldeep’s bowling was not up to the mark. There was no proper line and length in his deliveries. I did bring this to his notice after the match when he called up and also advised him to concentrate only on proper line and length without worrying about the wickets. The wickets will come automatically,” he added.